Water features, including ponds, waterfalls, fountains, and spillways, need to be winterized before the first frost. Fishponds require careful preparation for the Ohio winter so they don’t freeze. You want to make sure to protect your investment and for lovely water feature to resume working in the spring. You may have a circulating waterfall or spillway that can be turned off as the weather turns cold. The pump may be removed or covered after it is cleaned. It should be as dry as possible to prevent ice from collecting inside and outside of the unit. 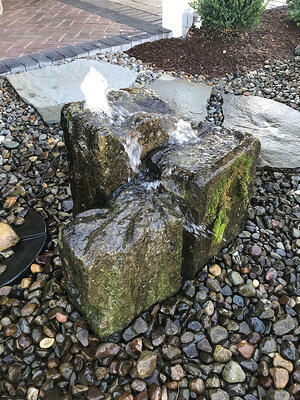 If the pump for the waterfall element is part of your water feature design, it should be winterized as well along with the feature. Any connecting tubes should also be drained of water in order to ensure a clean, dry line that won’t be damaged by low temperatures. Birds won't be using your birdbath or fountain until Spring so it can be covered to protect it. Freezing weather can crack cement, brick, and stone. A cover will help to protect your stonework from collecting ice in small fissures that can lead to larger cracks. Fishponds have a different procedure for winterizing. Fish that can live through the winter should be fed special food in the fall so they can "bulk up" before the water becomes colder. They will not eat as much when the water temperature falls below 50 degrees Fahrenheit. Remove all dead plants and other debris from the pond so it won't decompose and use up oxygen. Potted plants around a water feature can be moved to a warmer inside location. Water lilies may survive at the bottom of a deep pond during the winter. You can drain some of the water out of the pond and refill it with fresh, clean water before the temperature drops to 60 degrees F.
Experts advise covering a pond with fine netting to trap blowing leaves and other debris. The net must be above the water level and anchored to the sides of the pond. Flip leaves off of the netting. The pump should be removed and cleaned when the water temperature falls below 40 degrees. Fish will move to the bottom of the pond where the water is a little warmer and winter-over with little food. The pond may require a de-icer device that fits into the water as the temperature drops to freezing. This device has a limited heater that keeps the water from freezing completely and it preserves oxygen.